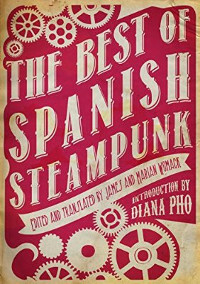 In her introduction to The Best of Spanish Steampunk, Diana M. Pho points out what has become a hallmark of the genre: it gives writers “an opportunity to unearth and highlight the underdogs of history.” The very nature of steampunk — its juxtapositions and unexpected connections — leads writers in the genre to explore what might have been had steam truly driven the world. Such an important alternative history, then, necessitates imagining significantly different outcomes in wars that were fought and those that might never have occurred. I can’t help but go back to another recent steampunk collection — The SEA is Ours: Tales of Steampunk Southeast Asia, edited by Jayme Goh and Joyce Chng — that did similar work, reimagining a world in which European colonial forces often failed to subjugate native populations, and where those populations developed steam-driven technology designed with their particular and unique environments and cultures in mind. The writers represented in The Best of Spanish Steampunk also reimagine conflict outcomes — the Spanish-American War at the end of the 19th century, revolts in Andalusia in the 1930s, etc. — using steam technology and its accompanying hazards and benefits to offer us alternatives. Each of these writers, too, has an extensive background in speculative fiction and ongoing interest in steampunk aesthetics. By bringing their many and varied voices together in one collection, James and Marian Womack have been able to show us the richness of steampunk written in Spanish as it manifests itself around the world. Split into seven sections (the last includes only novellas), TBSS runs the gamut of steampunk interests and aesthetics: politics, conflict, technology and innovation, “mechanical men,” time and perception, and even “metaliterature.” And while each story was enjoyable for its unique perspective on history or technology, a few became personal favorites. These include the very dark “Saturn’s Children” by Sergio Lifante, in which unsuspecting subjects’ dreams are distilled by a powerful steam-driven machine into a “perfect dream;” the hilarious “Hating Lester J. Murray” by Laura Fernández, about an obnoxiously-chatty airship with writerly pretensions; and the delightful-yet-rockin’ “Suprends Le Monde!” by Ismael Manzanares, set during the Paris Universal Exposition, in which the Eiffel Tower does…well…something unexpected. This is a very small taste of a much larger and very entertaining collection. If you’ve been looking to expand your speculative fiction horizons, or read more in translation, or learn more about the Spanish steampunk scene, this book’s for you. And for anyone who just loves a good story about airship pirates or the creepy Dr. Moreau, or political intrigue- yeah, this book’s for you, too.